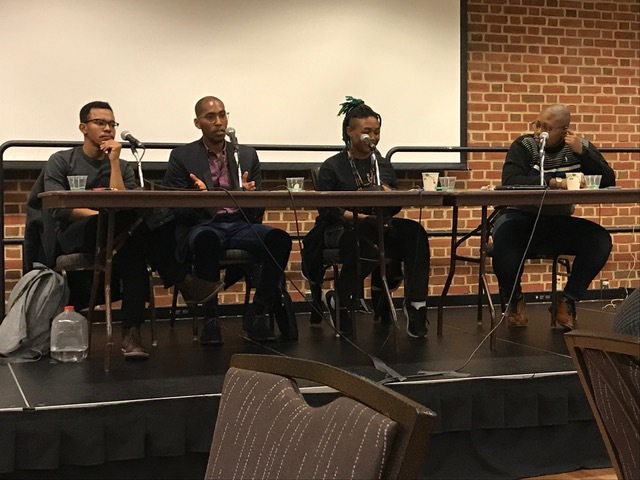 Students, professors and scholars discussed the definition of justice and what it looks like within the black community at the “Black Indigeneity in Conversation: Reimagining Justice” panel Tuesday evening. The event, sponsored by MICA and held in the Prince George’s room of the Stamp Student Union, was hosted by Clarissa Corey-Bey, a senior English major. The purpose of the panel was to have a conversation about the way justice currently lives within blackness and indigeneity. Panelists included Dr. Kyle Mays, an African-American assistant professor at the university; T. Cleo Doley, a high school educator; and Chad Infante, a postdoctoral fellow at the university. The conversation began with Corey-Bey asking the panelists and students how they define justice. One student shouted out healing while another added honesty. He added that honesty first starts with acknowledging the history of colonial bias. Infante asserted that it is the responsibility of blacks and indigenous people to constantly reflect on how to situate themselves in a stolen land. Doley stressed that community is what makes blacks indigenous despite the long length of time they have lived outside their native land. Senior geology major Lauren Shepherd posed a question while in attendance: How do you define charity versus justice? Panelists then stressed the importance of white allies and they role they play. “We have to be able to have white allies doing good work and that good work is literally putting your life and your material resources if you have it, putting all of it on the line,” said Infante. In response to the conversation, one student inquired how a white ally should handle backlash from black and indigenous people when they are trying to support the cause of justice. In one instance, the panelists disagreed on whether it was required to be an anti-capitalist to be indigenous. Doley claimed that it does while Mays professed that he wasn’t sure. The panelists concluded the event by encouraging students to attend other MICA-sponsored events and urging them to create their own groups and initiatives for the cause.